Building or renovating a kitchen today gives you more choices and options than ever before. Here is a basic breakdown of material options available for cabinets are solid wood, veneer, particle board, MDF, melamine, high gloss acrylic & thermofoil. 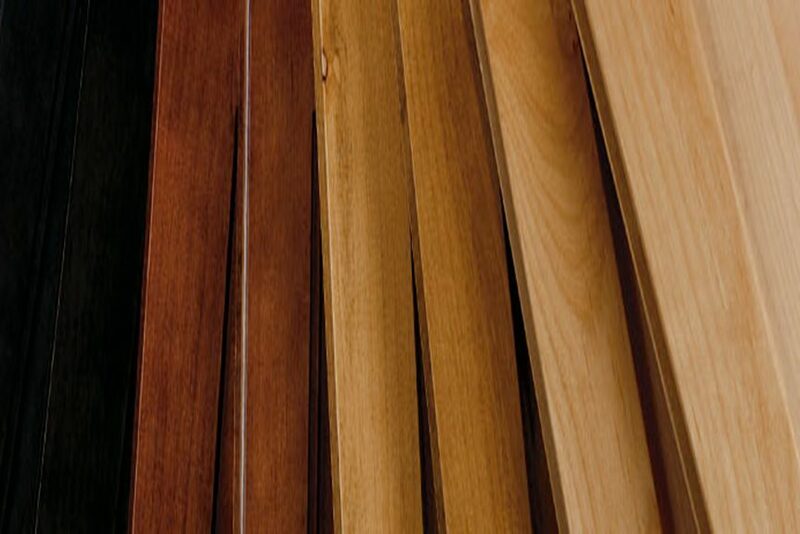 Solid Wood is natural and commonly used for cabinet fronts, countertops, moldings and other millwork. Because this is an actual wood product, temperature and humidity may cause the material to expand or shrink and change depending on the environment or room of your cabinets. When solid wood materials are used for your cabinets, it is essential to maintain proper humidity levels, the general recommendation, and best practice is to maintain 35-45% humidity in all seasons. Managing the moisture of your space will make sure that the stability and durability of the solid wood products remain preserved and that the cabinets don’t become subject to extreme environmental changes. Often times in Canada the humidity can change from 15% in the Winter to 50% in the summer, and therefore in the winter the solid wood products will want to contract while in the summer they will want to expand. Extreme seasonal changes like that will result in the solid wood products warping and cracking. MDF is an engineered wood product that is made up of wood fibers. The fibers are combined with a resin and become formed into boards and panels. MDF has a smoother, denser texture than particleboard and is used for cabinet fronts and other exterior options. Due to the density and stability of MDF, it is often used when a kitchen is being painted. MDF is generally more stable and not as prone to the environmental changes as solid wood as, which is why it is a great option to use for painted cabinet doors. Five-piece MDF doors are becoming more and more popular as they can keep the look of a traditional shaker style kitchen while achieving superior stability and durability over a more extended period. Particleboard is often known as melamine, an engineered, compressed wood product manufactured from wood chips, sawmill shavings, and sawdust. These wood products are combined with a resin and then pressed into panels. Once the raw particle board is ready, the panels can be taken and painted or coated with different types of paper or wood veneers. In recent years many advancements have been made with thermally fused melamine to great pre-finished melamine products that replicate the look of real wood. These TFL panels are much more stable and durable than real wood while maintaining the same styles and finishes. Melamine is frequently used as an option for cabinet interiors, however, due to the newer colors and finishes being made available it is becoming more popular as an option for cabinet exteriors. Plywood is made from layered sheets of wood. While more expensive as an option for cabinet interiors, plywood is more durable, lighter, more stable and holds up to water and moisture a lot better. A UV finished plywood such as birch is used for cabinet interiors. Thermofoil or Vinyl is a plastic material which is thermoformed to an MDF substrate using a press and is often used as a material for cabinet fronts. Many different colors are available making the options endless when making vinyl fronts. Thermofoil fronts are a lot more stable to MDF being used as the core; however, because of the nature of how they are made, they can be susceptible to heat. Extended exposure to a heat source will result in the plastic material peeling away from the core and discoloring. Thermofoil has no problem holding up to other environmental changes such as high or low humidity, and if the MDF core is sprayed with a heat activated glue before being thermoformed, a thermofoil front will hold up very well over time. Acrylic is a relatively new cabinet material option that has been popular in Europe for a very long time. The most durable form of acrylic is manufactured by applying UV acrylic lacquer to an MDF core, or by laminating a 1mm thick scratch resistant top layer using PUR adhesive the provides the highest structural bonding strength. Acrylic is very easy to maintain and offers excellent scratch resistance. Advancements in edgebanding technology have allowed cabinet manufacturers to manufacture acrylic panels and doors with a completely seamless joint. While generally, high gloss is the most popular kind of acrylic finish, newer options such as matte have become available as well in recent years.